Home / Posts Tagged "Portrush"
As early as February 1915, local newspapers reported that 150 artillery pieces captured from the Germans were in London and that they would be presented to districts, “which had done good work in the cause”, after the war. However, during the period of the war some war trophy guns were displayed in locations in the north of Ireland – two machine guns captured by the Ulster Division were sent to Londonderry (November 1916) and Portadown (July 1917) and a field gun was on temporary display in Belfast in 1916. In December 1918, five captured guns were presented by Brigadier General George William Hacket Pain to the City of Belfast. In accepting the guns, which were placed in front of the Queen Victoria Memorial at Belfast City Hall, the Lord Mayor of Belfast, Sir James Johnston, said, “they would be cherished as mementoes of the great world war” and finished his speech with “The guns would remind many generations to come of the great victories achieved by our gallant soldiers”. From as early as 1924, there were no guns on display at the Queen Victoria Memorial during the various Somme and Armistice Day commemorations held in front of Belfast City Hall. As had been intimated in 1915, the captured guns were distributed to locations across the United Kingdom, although guns were generally not delivered to locations in Northern Ireland until 1923 due to the civil disturbances in the opening years of that decade. 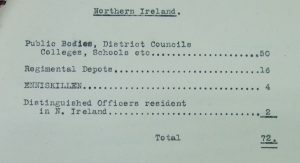 Documents at the National Archives in Kew record that 72 trophy guns were allocated to Northern Ireland. Whilst most went to urban or rural councils, trophy guns were also on display at Queen’s University in Belfast, Campbell College in Belfast and Portora Royal School in Enniskillen. However, it is clear from newspaper reports that the trophy guns were not always welcomed or wanted. Also, some public representatives were dissatisfied with the trophies that they did receive and some councils either did not put them on display or removed the guns from display with unseemly haste. 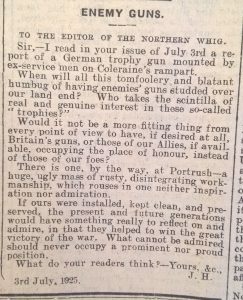 Some members of the public also questioned the desirability of having trophy guns on display, as demonstrated by a letter “Enemy Guns” published in the Northern Whig on 6th July 1925. In April 1923, the Belfast News-Letter reported that the War Office was sending four eight-and-a-half ton guns to Enniskillen and that the council was asking for the number to be increased to six guns. One of the guns was subsequently sent to Portora Royal School, which had already received one trophy gun directly from the War Office. In March 1925, the Northern Whig reported that Enniskillen Urban Council had removed the German gun from the Diamond and the same newspaper reported, in December 1926, that the two guns outside the gaol were, “to be placed at the rear of the old gaol (out of the public view)”. 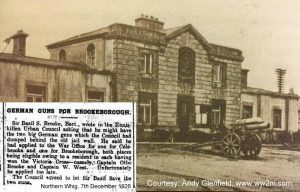 In September 1927, the Belfast News-Letter reported (see inset) that Sir Basil Brooke had written to Enniskillen Urban Council requesting the guns for Colebrooke House and Brookeborough. The Colebrooke House gun has been on display at Enniskillen Castle since February 1976. 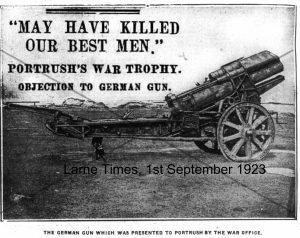 In March 1924, the Ballymena Weekly Telegraph reported that Mr George McMullan expressed the opinion at a meeting of Portrush Urban District Council that, “the German trophy should not be exhibited. I would rather it were thrown into the sea”. Mr Christie, Chairman of the council, replied that, “the gun might have been captured by Portrush men”. Bangor received two war trophy guns – a howitzer/mortar was placed next to the coast at Kingsland and the deck gun from the German submarine U-19 was placed in Ward Park. This submarine was notorious at an international and local level, having sunk RMS Lusitania and landed Sir Roger Casement in County Kerry in advance of the Easter Rising in Dublin. This gun was dedicated to Commander Edward Barry Stewart Bingham VC and is one of only three Great War trophy guns that remain on public display. On 2nd October 1935, the Belfast News-Letter reported that Bangor Borough Council had decided to sell the Kingsland trophy gun for scrap, a decision which incurred the wrath of the Bangor Branch of the British Legion, which submitted a letter of complaint. The council subsequently reversed its decision. Their proposal was to erect a suitable platform for the captured German gun on the triangle in front of Balnamore post office, with the names carved on the sides. The gun was delivered to the village in October 1923 and, in September 1933, Hale, Martin & Company (who had taken over the spinning mill) handed over the memorial platform and the gun into the council’s care and keeping. In nearby Ballymoney, there was uproar at the Urban District Council regarding the gun that was delivered to the town in June 1923. The Northern Whig and the Belfast News-Letter both reported on discussions in the council chamber concerning the gun. Mr Robert McAfee expressed the opinion that “the town Ballymoney was deserving a better trophy. lt is 32 years ago since it was manufactured, and I question whether it was in the late war at all. It is like a piece of down pipe of spouting set on two wheels”. The field gun was placed on a pedestal in the small green at the Town Hall. 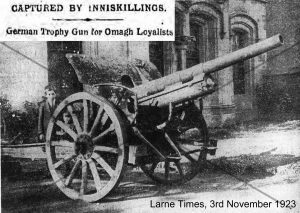 In Omagh, there was opposition from Nationalist councillors on the urban council to the trophy gun that was to be sent to the town by the War Office. In March 1923, Mr Orr spoke in favour of receiving the guns, saying that, “this was a matter above party or politics, as the men of their local regiment, the Royal Inniskilling Fusiliers, of which they were proud, belonged both to the Orange and Green flag”. Two months later, the Mid-Ulster Mail reported on the ongoing wrangle between rival councillors. Mr McLaughlin said, “the council should never have considered the question of taking the gun at all, as the feeling of the majority of the members was totally against”. Meanwhile, the British Legion in Omagh had secured a German machine gun (reported as having been captured by the 9th Battalion Royal Inniskilling Fusiliers). 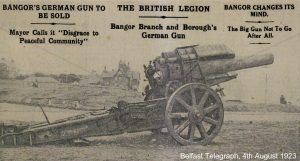 The Londonderry Sentinel reported on the ceremony in which the machine gun was placed outside the premises of the Omagh Branch of the British Legion. Following representations from a local solicitor and councillor, Captain William Henderson Fyffe MC, a German gun that had been captured by the 5th Inniskillings in Northern France in the closing days of the war was secured for the Omagh Loyalist Association and this gun was placed outside the Protestant Hall in Omagh in October 1923. 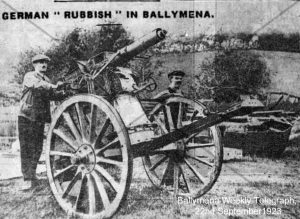 In October 1923, the Ballymena Observer reported that the German guns sent by the War Office to Ballymena had not received a fulsome welcome by Ballymena Urban District Council. The Clerk said the guns they had received – one howitzer and one Maxim – were not suited to the importance of the town. They had been promised two field guns and a machine gun but had only received one field gun and a machine gun. The Chairman remarked, “if we are to have war trophies for the Memorial Park let them be something presentable. Other towns of much less importance than Ballymena have been able to secure something better than derelict German machine gun for their Parks”. One of the councillors, Mr Craig, went further saying, “What do we want with them, a lot of German rubbish?”. Carrickfergus Urban District Council had requested two field guns and two trench mortars. However, the War Office offered a heavy field gun, a field gun and a machine gun but sent two heavy guns. These guns lay in the London Midland & Scotland Railway Company’s yard in Carrickfergus until 1929. Although they were never put on public display, the council spent £40 cleaning and painting the guns. 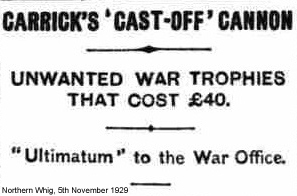 In November 1929, the LMS Railway notified the council that the guns had to be removed within two weeks, prompting the council to send an ultimatum to the War Office stating that, “unless Carrick is relieved of its cannons they would be sold as scrap”. On 3rd December 1929, the Northern Whig reported that the council had accepted a tender of £12 [approximately £700 today] from O & T Gallagher of Corporation Street in Belfast. 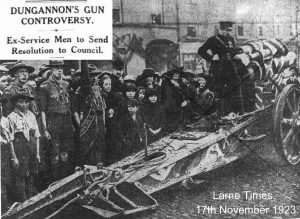 In Dungannon, the trophy gun was pulled into position outside the British Legion’s new club premises for the Armistice Day commemoration in 1923. Six years later, due to bus traffic, the gun was moved from Market Square to a position overlooking the ex-Servicemen’s houses on Empire Avenue. 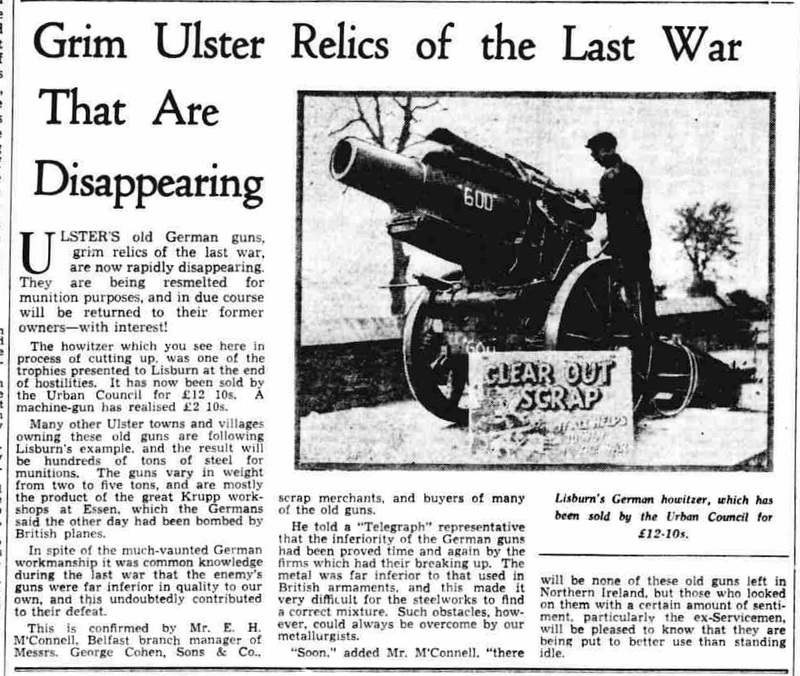 In late 1937, Dungannon Urban Council considered a proposal to sell the gun for scrap, but this met with opposition from the British Legion and ex-Servicemen, who decorated the gun with a Union flag and a notice declaring “Not for Sale Lest We Forget”. There is still a German field gun on display in the park on Black Lane, the site of Dickson’s Mill. The information panel at the site records that the gun had been purchased by the Dickson family at an auction of military artillery in the south of England in 1920. There are, to the best of my knowledge, only three trophy guns from the Great War still on display in Northern Ireland. A list of the locations in Northern Ireland that received trophy guns is contained in this spreadsheet which, where possible, details the fate of the guns. Written by History Hub Ulster member Nigel Henderson. *The below article from the Larne Times (25th May 1940) demonstrates that many were sold for scrap as part of the war effort during the second world war.